An accident in Solon Township Sunday night sent two people to the hospital, one with possible life threatening injuries. 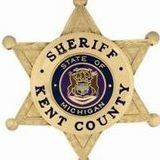 According to the Kent County Sheriff Department, Chad Wehler, 22, of Howard City, was driving a 2002 Pontiac Grand Prix eastbound on 18 Mile about 10 p.m., when he pulled out in front of another car traveling southbound on Algoma. The other car, a 2001 GMC Yukon, driven by Kylie Burns, 24, of Howard City, struck Wehler’s vehicle in the driver’s side door. Wehler had to be extricated from the vehicle and was transported to Butterworth Hospital by AeroMed with possible life threatening injuries. Burns was transported to the hospital by Rockford Ambulance. Both drivers were wearing seatbelts. Police believe alcohol was a factor in the accident.